Art storage is an art unto itself. First of all, not all “art” is a painting on a canvas so, when considering how and where to store art, consideration needs to be made about what type of art it is. 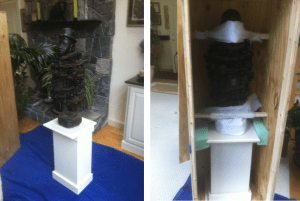 A few years ago, when we had Merv Richard, Chief Conservator at the National Gallery of Art in D.C., training our entire staff for 3 days on proper handling and storing of art, we learned a lot about proper storage for all types of art. Two dimensional – paintings, drawings, photos, etc. For two dimensional art, protection and storage is either vertical or horizontal. These types of art are the easiest to, not only store but, to provide stable protection around. Three dimensional art requires, not only a lot more storage space but, considerably more time and materials to properly prepare for handling and storage. Any art that requires storage should always be in a climate controlled environment, even if it is an outdoor sculpture made of bronze. Patina on a sculpture is the inherent interaction of natural elements with the piece of art itself and that patina represents a very specific environment. Moving this piece to another location could alter the way nature interacts so, inside storage is the way to go. Contrary to many “collectors” concerns about perfect humidity and exact temperatures, there is some “wiggle” room in these areas. Unless the collection is in a 100% controlled environment at the collector’s house, which is very hard to maintain, your average higher end art will handle a few degrees of flexibility. Fortunately, humidity and temperature go hand-in-hand and 74 degrees will usually maintain a humidity that art can tolerate. The absence of moisture, like in a dry, cold climate, can be devastating to art while in storage. Wood will crack and oil on paintings can peel. Likewise, as temperatures move close to 80 degrees, humidity becomes a factor and can prove disastrous to art while in storage. Making art storage and climate controlled storage a must have. There are several categories of “flat” art and, some require different storage practices, especially if the storage is long term. Fabrics, canvases, photos, paper, wood, glass, are just a few of the mediums that art is put onto. Depending on the age, materials and length of storage time, these two dimensional art pieces will have to be either storage vertically or horizontally. Unframed, older paper art/documents should be kept flat while well framed and prepared pieces can be left in a vertical position for storage. The most important part of storing three dimensional art is the “preparation” needed to transport it to storage. I remember having to transport a multi-faceted sculpture that the owner had put onto a swivel pedestal (absolutely not how any art should be mounted…by the way) and the challenge was to keep the piece from spinning while at the same time not disturbing the several hundred year old patina and countless small, fragile pieces that jutted out in all direction. I have a fondness for fine art, therefore, I never want to see art damaged in anyway. This is why we offer the white glove art handling services. Let us know if we can help you move and/or store your art. I hope you found this rather long explanation helpful. Have a great weekend.